Srinagar, Nov 16: Stressing the need for improvement in ‘brand Kashmir’, Deputy Commissioner Farooq Ahmad Shah Saturday said there was huge potential to explore avenues in fields like agro industries and the tourism sector in the Valley. “In the past ‘Kashmir’ was considered to be a prestigious and famed brand in global export market, but now the scene is that we have mostly become a consumer market,” he said, adding that improving the brand Kashmir was the need of the hour. Shah said Kashmir had little number of success stories in private enterprises and brands. 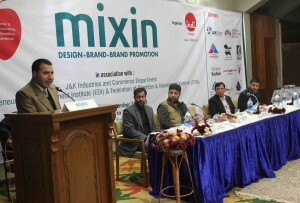 Speaking at ‘design and business talk at SKICC’, an event organized by “Mixin” a brand management company, Shah said there were plenty of entrepreneurs in Kashmir who started their businesses but couldn’t make it big because of the lack of exposure and support. “There are many entrepreneurs who have taken loan from the Entrepreneurship Development Institute (EDI) but majority of them has not even able to repay it,” Shah said. Citing an example of Gujarat, DDC said despite being a “non-tourist” place, Gujarat spent forty thousand crore on tourism this year which was the eight year budget of Jammu and Kashmir. Later, leading industrialists, designers and creative thinkers also shared their stories of making their brand successful. “Basic idea is that people can’t buy what they don’t know exists in the market,” he said. Others who spoke on the occasion were Sudhir Sharma CEO Indi design, Dr H. Shah Joint Director I&C along with others. Greater Kashmir was the media partner for the event. Srinagar, November 16: Asking the young entrepreneurs to create a brand image of their products, District Development Commissioner Srinagar Farooq Ahmad Shah Saturday said that there were less number of success stories in Kashmir in private sector. Speaking at an event ‘Mixin’- organized by Indi Design- a design and innovation consultancy- at SKICC, Shah said that there were many entrepreneurs in Kashmir who started their businesses but couldn’t make it big because of the lack of exposure and support. The event was organized in association with J&K industries and commerce department, Entrepreneurship Development Institute (EDI) and Federation of Chamber and industries of Kashmir (FCIK). “There are many entrepreneurs who have taken the loan from the Entrepreneurship Development Institute but majority of them have not been able to repay it back,” Shah said. Giving an example of Gujarat state, Shah said despite being the non-tourist place it had spent Rs 40,000 crore on tourism this year which is the eight-year budget of Jammu and Kashmir. Shah said that there was a desperate need of branding the products to compete with other states of India. “Handicrafts, carpets, shawls in Kashmir can be a brand name across the world if we work hard and be honest in the trade,” Shah said. Later, experts, designers and creative thinkers also shared their stories of making their brand successful. The other dignitaries who were present on the occasion include president Federation Chamber of Industries Kashmir Mohammad Ashraf Mir, CEO Indi design Sudhir Sharma, Joint Director I&C Dr H Shah along with others. More than 200 participants visited Mixin program in Srinagar on 16th November 2013. Thank you for overwhelming response!